Heat olive oil in a large pan over medium heat. Mix all dry seasonings together in a shallow bowl. Rub each breast with the mix. When oil is hot, place chicken, breast side down, into the pan and sear about 2 minutes. Transfer into the crock pot, breast side down. Fill with enough water to fill the crock about 1/2″ high. and then add the Worcestershire sauce. Bake on medium for 6 hours or so. 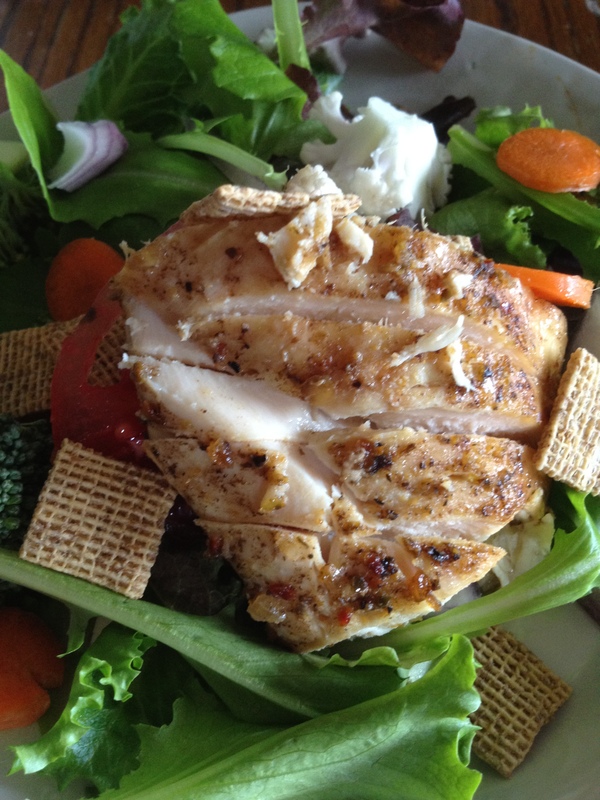 Since I love my greens, I topped a tossed salad with the sliced chicken and used Cascadian Farms’ Multi-grain Squares as croutons in keeping with the Chex Mix theme. I kept the remaining chicken in some of the juices from the slow cooker and it made for excellent leftovers! Did I mention our friend went back for seconds?